I started the "52 Quilts in 52 Weeks" blog two-and-a-half years ago in response to the Younger Son's nagging. It was November of 2011, and in July of that year I had mentioned that I had made 36 quilts so far that year. Elder Son said, "You've almost made a quilt a week!" I took up the challenge, and for the rest of that year, and the next, and the next --- I made one quilt (top) per week. I remember how excited I was when my friend Amy became my very first follower! And Randi of Fresh-Squeezed Fabrics was the first person to comment. As with most bloggers, it was slow going at first. What do I write? Will people care? If you build it, they will come! My very first giveaway was for 50 Followers. I thought I'd really "made it" when 50 (!) people read my blog! Nearly 70 people commented on that post, and the winner was Lori of Lori H Designs. I'm sad to see that Lori hasn't posted anything new on her blog since last August. 52 Quilts reached the 500 Followers just a few weeks ago, and Barb in Michigan received a fat quarter bundle of Kona cottons to celebrate. Now it's time for a really BIG! giveaway. And rather than shop for something and hope you like it, I've decided to let the winner choose. 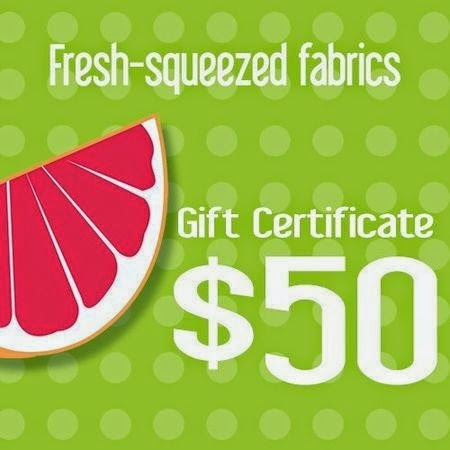 So the prize for the winning comment is a $50 gift certificate to Fresh-Squeezed Fabrics. Since the owner was the very first person to comment on 52 Quilts in 52 Weeks! If you're a no-reply commenter, please include your contact information. Giveaway ends Saturday, June 7 at noon MDT. Thank you for making 52 Quilts in 52 Weeks so much fun! I followed a link from StitcheryDickoryDock to your Susie's Magic Binding tutorial. Congrats on making it to 500 posts! I found 52quilts as you wee listed on another site. I was curious and liked what I read so signed up for the emails. I really like the posts and that you send an email instead of being lumped in with lots of other blogs. Keep up the good work! I can't remember how I found you - it was a long time ago!! I think I found you and your blog when I was just starting to discover what blogs were and couldn't believe 52 quilts in 52 weeks was even possible!!! Blogs are such a fun way to meet poeple and see their creativity and also to record what we are up to! Happy 500 posts - amazing!! I don't remember how I found you. I started blogging at the end of last year so I could join the link-ups for a quilt along. I guess one of the people I linked to was a follower of yours. I do remember being intrigued as to whether you really were making one quilt a week! When I looked to find out more your site was offline for repairs. I just kept coming back until you were online again and saw you did indeed have a phenomenal output! I liked your binding tutorial so I became a follower. I really don't remember how I found you, but I do follow you through Bloglovin. You know Marti, I have no idea how I got here LOL but I'm glad I did, as I enjoy all your posts. I have too many UFO's at present, but have added the block-a-day star quilt to my must-make list. congratulations, and keep going with the blog! I only found you in the last few months, but I honestly don't remember how. I hop around all the time following links and reading the blogs, hopping to blogs on peoples' blog rolls... linky parties... that sort of thing. So I don't know. But I added you to my reader as you're a keeper! Bravo ! From a linking party ...I think ..! I have no idea how I got to your blog, but I remember your blog title and wondered if it was possible to do 52 in 52! You are an inspiration to me! Sorry, I follow quite a few blogs and have forgotten how I found you. Usually, I find new blogs from mentions on other people's blogs. Posts like "OMG, look what she made!". I probably found you from a link on another blog, but it's been a long time and I don't remember exactly. I enjoy your posts, and the lovely quilts you share. Congrats on your milestone! I've been a reader of your blog for over 2 years, so I don't remember exactly how I found it, but I probably got there via a link on another quilting blog. Congratulations on 500 posts & thanks for the giveaway. Woohoo, 500 posts! I think I came to your blog through a link on someone else's blog. Congratulations on the big 500! I found you through a linky party, but I don't remember which one. I was really interested in the quilt a week idea. I am relatively new here and I found you through Pintrest, a pin of your Farmers Wife quilt. Loved that it was not in the typical muted colors. I'm not entirely sure but I think it's a safe bet I found you through a giveaway. That's how I've found a lot of the blogs I now follow. If that's not it, then I found you through a blog I already followed. I found you from your Prairie Windmill quilt - stunning. Been following ever since and love it! I found you through your blogs name (google search). Then started following. I was amazed anyone could make 52 quilts in 52 weeks. Thanks for your tutorials and your inspiration! I found you through a link to your Susie's Magic Binding tutorial. I keep coming back to see what you are up to and am in awe of all you get done! Congratulations on your 500th post!! When I started back up sewing again I google searched for "sewing quilt blogs" to get some ideas - not sure if I found you through that or by following other blogger's liked blogs to you! Thanks for the giveaway! Congratulations on 500 posts! I think I found my way to you through a link on someone else's blog. I hope you keep on blogging. I honestly cannot remember...but the name intrigued me so I guess I must have come across your blog at a Linky party. I can't remember how I found you, but I would guess it had to be through a link somewhere. Congratulations on such a nice achievement. I can't remember how I found you, but I remember being intrigued by the name.... How in the world could anyone possibly get this much done? I have enjoyed reading your blog and seeing how you do things. Always something going on and always such a happy, helpful place to visit! I am sure I found you through a link or someone else's blog. To be able to get 52 quilts done in a year is amazing! Keep up the great work and blog. Congratulations. I honestly do not remember how I found your blog, but I love it. The variety of quilts are so inspiring. Thank you for posting 500 posts and counting. Thanks. I found you via Missouri Mel. I've been a follower of your blog for quite a while now. Love what you have to say. Thanks for a chance to win. wow - happy 500 posts! I found your blog through someones 'blogs I love to follow' on their blog - such a great way of finding new people. I have been following you for awhile now, and don't remember how I got here. But, I sure am glad that I did. Thanks for your daily inspiration. I also found you from someone's "blogs I follow" list. It was amazing to me that you were working to make 52 quilts in 52 weeks. I loved seeing all your projects! Congrats on 500 posts and 500 followers! Thanks for the chance to win. Found your link at Missouri Mel's giveaway day post. Looking forward to following along. On Pinterest, and I am so glad to have found you! I found you by following the link from Cascade Quilts blog. I check in every morning to see who has made what. Love the inspirations from all the quilts and pictures. Thank you for sharing, I truly enjoy it. Congrats! I'm not sure where I found your blog, but I've been a subscriber ever since, and that's been a couple of years now! I love the inspiration you so willingly share! I met you at a class at Ruth's. Congratulations on 500 posts!! I'm not really sure I how I found you, but I'm so glad I did! From the beautiful quilts you create, to the inspiration to complete 52 in a year, complete a UFO every month, and a Block a Day, you are a great role model for us. Thank you! I think I found you just by searching for blogs with quilting content. My stitch group is participating in a modified version of your 12 in 2014 - we eagerly await the new number each month! I don't remember how - maybe through Quilter's Newsletter? Or did I find them through you? I know it was a link from something interesting...And I'm glad I stayed! Just found you while scanning around. Look forward to seeing and reading all that you do. Congratulations! I found you on Giveaway Roundup. Thanks! Congratulations on 500 posts!! I found you on Missourie Mel's Giveaway Roundup. Just the other day my youngest son said to me that I spend so much time reading blogs that I should start one. Looking forward to following you. Alas, I surf so much that I have no idea how I found you--but I'm glad I did! Congrats! Oh my, I can't remember that far back! It must have been through a giveaway or some sort of blog hop. Not really sure how I found you, probably from another blog or a hop. Really happy that I did. You showed one of my quilts (DPN) and gave me a push that I needed to finish a couple more of a different pattern. Thanks so much for all the inspiration. Found you through Google! :) Congratulations! I honestly do not remember how I found 52 Quilts. There for a while, my FB page was filled with cooking sites, then slowly I deleted all of those and went with ALL quilting stuff; have never looked back! I really don't remember how I found 52 Quilts - either on Facebook or browsing the internet. Once I looked, though, I was hooked! I played all through 2013. I still working on my UFOs in 2013 too. Congratulations to you! I am a new follower, came over from Missouri Mel's blog! thanks! I found you because of the FRMQG! And now that my baby is older, I really need to get back to attending meetings. I miss it! Just wanted to thank you sooo much for the FQ bundle I won from you! I received it yesterday and it's fabulous!!! Please do not count my comment for your new give away - I have been already so lucky! Thanks again! And congrats on 500 posts! Gosh, I really don't remember how I found your blog, but started following you right away. Congratulations on your 500th post! I first learned about you at a quilt retreat in Jerome, ID at the monks. You taught us to do Susie's magic binding & have been using it ever since. Follow you DAILY!!! I think I found your blog through the lady who always names her kwilts with Ks. Who's name I forgot because I have toddler brain. I don't remember, but I'm glad I found you! I can't believe how many you get done! I found you with a link from another blog...don't remember which one. I liked what I saw and now follow you via Bloglovin' . I found you by accident I was just doing some blog surfing and there was a link to your's and since then I've been following you. Thanks for the chance to win. Congrats! I found you through a linky party! Congratulations of 500 posts. Always enjoy your blog, but I don't remember how I originally found you. Wow, I don't remember how I found your blog. I do know that I am happy to follow you. Congrats on 500th post! I am certain that I discovered you and your blog during a blog hop long ago!! What amazes me is that you actually make one quilt per week... Amazing and inspiring!! I think I found your blog by clicking a link button on someone else's blog, but I couldn't tell you whose. Congrats on another milestone! Found you via Missouri Mel's link up. I found your site from Missouri Mel's link up. Thanks for the chance! First visit to your blog. Found you on Missouri Mel's link up. Congratulations on your milestone! I found you totally by fluke! I bookmarked you on my Kobo and because I forgot my Blogger password, I just keep hopping to my bookmark! Congrats on your milestone! I am a l m o s t at 100 posts! haha! I think I recall finding your blog on someone else's blogroll. I was intrigued by the name - I had to check out this prolific quilter! So I did, and I enjoyed the blog, and now I follow you via Bloglovin. Thanks for all the inspiration, and congratulations! And thanks for the chance to win too! I love fabric and stumbled upon your site looking for fabric giveaways. I just finished my first quilt about 3 weeks ago and am about to start another one. Thank you! I have been following by email for quite a while. I really can't think of how I found you originally...maybe a blog hop? I can't for the life of me remember how I found you. It was probably when I was scoping out someone's blogroll. The name intrigued me. I am so impressed with your quilts. I admire people who can create a goal, like your block a day, and stick with it. I need more prodding to accomplish something like that! I found you through Bloglovin and was amazed that you could stick with one quilt top per week. That was and is a wonderful commitment. Keep goin' girl! I found you through Bloglovin...probably through Pat Sloan's blog. Thanks for the chance to win. I believe I found you through Design Wall Monday. I am still amazed at the idea of 52 quilts in 52 weeks--that is an amazing output. Congrats on 500 followers! You actually found me! I was at Ruth's looking for a stand to hold my increasing number of rulers and you were in line behind me. Not only did you give me a contact for my custom made ruler, you gave me your card with your blog info. I'm learning and being encouraged - thanks. I honestly do not remember how I came to your blog, but I'm glad I did!! Congrats! I think it was through the 2012 new blogger blog hop or maybe small quilt meet up? I'm not sure but I think I found your blog listed on the side of someone else's blog. Congratulations on your milestone! I was looking for some tutorials to inspire me. Its cloudy and rainy today and I need some color inspiration. I don't recall, but I'm sure it was either from someplace you may have linked and/or commented or from someone else's blogroll. Congratulations on your 500th post! and in 500 followers (though I see it is now over 700). Congrats! I found you via Missouri Mel Giveaway Roundup. I am a new follower now via bloglovin. Don't remember the where I first saw the link to your blog. Love the quilts! I don't remember how I found you, maybe a previous giveaway. I googled Magic Binding, which brought me to your website. Not sure but I think it had something to do with your Little Sailor. Sewing on the ship maybe? Or a quilt of valor? Gah! I am just not sure! I found your giveaway on a link from another sewing blog! I'm really not sure how I found your blog. I must have found it on a link from another blog. Congrats and thanks for the giveaway! I can not remember how I found you, but was so impressed, I added a "rss" feed to my home page. Now, when ever I log in on my computer...there YOU are. I love your tutorials and I have shared many times the link to Susies Magic Binding. LOVE LOVE LOVE that binding. Congrats on your 500. I don't remember how I found your blog, but I'm sure it was due to another one linking to it. I tend to read a few, and then check out the people that they refer to in their posts. Ever since, tho, you are on my favorites list and I read you at least weekly. Congrats on reaching a milestone. I don't remember how I found you, probably on a blog hop. I think I heard about you from my daughter to. I was not really reading blogs but she was. I think she found you from Sitchery Dickory Dock. But it could have been thru Plum and Judy's blogger link up. I think I found you on a link party, but can't remember any more, sorry. I do love your blog though, lots of inspiration. I am a relatively new follower, yet I still can't remember how I found you! Likely through a link on some other blog or tutorial. So glad I did, though! Lots of pretty things to look at and add to my ever growing list of ideas! I don't remember how I found you, but I am glad I did! Congratulations! I followed a link from another blog. Can't remember which because I don't go to that one anymore but check yours out all the time as well as follow you on FB and Bloglovin! Now, back to trying to finish something for June! Congratulations!!! I got to your blog from Amy of Stitchery Dickory Dock.. Thanks for have a GREAT blog! I was clicking on all the blogs on Sinta's Pink Pincushion blog that are in the Schnibbles blogroll. And THERE YOU WERE! Right at the top of the list. I found your blog from a friends post on facebook a few years ago. LOVE IT! I look forward to reading your blog, and getting new ideas and info. I found you on Missouri Mel's blog. I wanna be you when I grow up - after retirement (12-1-14!!!) If I could make 52 in 52, I'd have lots of quilts for grandchildren and for the Mayo Clinic/St. Mary's Hospital Pediatric Infusion Therapy Unit (kids' chemo) where I donate quilts for their brave kids. I had the honor to be a 2013 member of quiltmakers scrap squad with you!! It was a really fun year!! Glad to have had the pleasure !! Congrats on the 500th!!! It's too long to remember, Marti! Most blogs I read I found through links on other people's blogs. Congratulations on reaching 500 posts! Blog hoppin again today. When I type in anything to do with quilting, your site is always on the list. I've visited before for various reasons (WIP wednesdays, etc) but today I found you via Missouri Mel's giveaway link up! I found you on beaquilter's list of blogs she follows. I can't remember how I found you either - but I really enjoy your posts. Congrats on hitting 500! Marti, I can't remember how I found you, but I do know that I have followed you faithfully through rain and snow and dark of night (my daddy was a rural mail man), and have greatly enjoyed the extraneous benefits of your blogging (off the clock, so to speak). I do like the block of the month patterns but due to the size of my work area I am working on potholders and hot pads. There was a book that had many traditional patterns scaled down for potholders. the blankets that i do are usually crib size blankets and I tie them since I don't where to go here in Dexter, Missouri to have them quilted.